Organizations require complete situational and holistic awareness of strategy and objectives in order to see the big picture and its impact on the organziation. Distributed, dynamic, and disrupted business requires the organization to take a strategic approach to integration and automation of strategy management. This fails when addressed as a system of parts that do not integrate and work as a collective whole. Organizations need full visibility to understand the interactions and relationships of cause and effect across strategy, process, transactions, information, and technology supporting the organization. They need to be agile and strategically gather scattered data into a single repository, that supports a building-block approach to managing and monitoring strategy and risk, is extensible for workflows and accountabiltity, and enables shared insight across the entire organization. 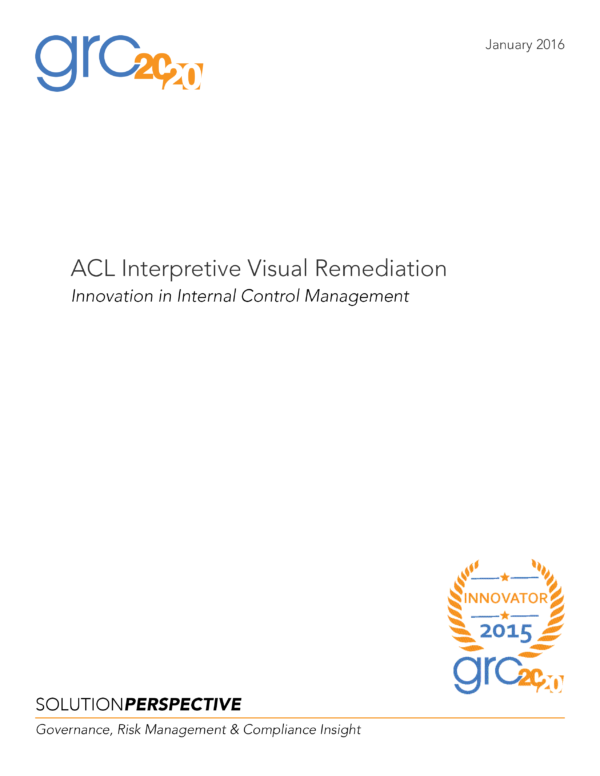 ACL’s Strategy Module is a GRC solution that GRC 20/20 has researched, evaluated, and reviewed that is agile for use in complex, distributed, and dynamic business environments to define, align, and monitor an organization’s strategic objectives. ACL delivers a new breed of GRC technology that leverages an intuitive Cloud platform to streamline strategy management and GRC processes to make them more efficient, effective, and agile. The solution delivers significant business value and brings a contextual understanding of strategy management across an organization’s distributed and heterogeneous environment. 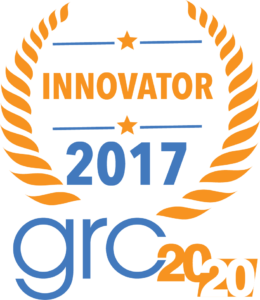 In this context, GRC 20/20 has recognized ACL’s Strategy Module with a 2017 GRC Innovation Award for the technology innovation in strategy management. Have a question about ACL or other strategy management solutions available in the market? 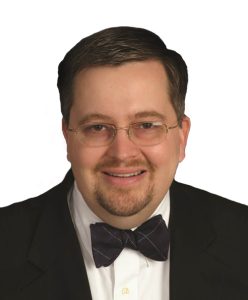 Organizations require complete situational and holistic awareness of strategy and objectives in order to see the big picture and its impact on the organziation. Distributed, dynamic, and disrupted business requires the organization to take a strategic approach to integration and automation of strategy management. This fails when addressed as a system of parts that do not integrate and work as a collective whole. Organizations need full visibility to understand the interactions and relationships of cause and effect across strategy, process, transactions, information, and technology supporting the organization. 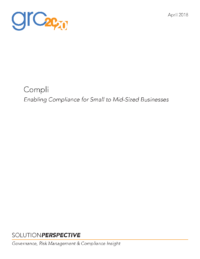 They need to be agile and strategically gather scattered data into a single repository, that supports a building-block approach to managing and monitoring strategy and risk, is extensible for workflows and accountabiltity, and enables shared insight across the entire organization. 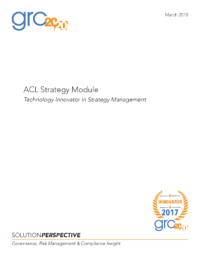 ACL’s Strategy Module is a GRC solution that GRC 20/20 has researched, evaluated, and reviewed that is agile for use in complex, distributed, and dynamic business environments to define, align, and monitor an organization’s strategic objectives. ACL delivers a new breed of GRC technology that leverages an intuitive Cloud platform to streamline strategy management and GRC processes to make them more efficient, effective, and agile. The solution delivers significant business value and brings a contextual understanding of strategy management across an organization’s distributed and heterogeneous environment. In this context, GRC 20/20 has recognized ACL’s Strategy Module with a 2017 GRC Innovation Award for the technology innovation in strategy management.